Nordic skiing includes all types of free-heel skiing including classic and skate cross-country skiing, ski jumping and telemark skiing. However, most often it refers to cross-country skiing. Practiced all over the world in snow-covered areas, cross-country skiing is more accessible as it does not require mountainous terrain and is less expensive than alpine skiing. Historically used for travel, it is also wonderful aerobic exercise and a fun way to be in nature. Compared to alpine skis, especially the fat powder style, cross-country skis feel like gliding on a tight rope. About two to three inches wide and arched vertically so they are taller under foot than at the tip or tail, the skis don’t have edges, which make balancing through a turn tricky. The leather boots, with only a little plastic to support the ankles, attach to the ski at the toe for full foot mobility. Longer classical skis require temperature specific kick wax under the foot to create traction. 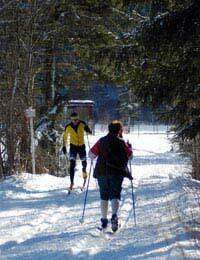 Cross-country poles are longer than alpine poles, so skiers can use their upper body and arms for leverage. Combined with the legwork, the arm action increases aerobic activity, so athletes often dress like winter runners, in light tight spandex or wicking fabric tops and pants, fleece, light gloves, and ear band or hat. Backcountry touring, done with more alpine style skis and telemark boots and bindings, takes the classical style cross-country skier into nature with better balance in all terrain and snow levels, with the ability to carry survival gear in a pack or pull it on a sled. Modern cross-country skis can be taken into the backcountry, but the low surface area makes maneuvering in deep powder difficult. Resorts offer cross-country skiers trails of various lengths that trek through forests, by lakes, across valleys, up and down hills and even through towns. At Jackson Hole Mountain Resort in Teton Village, WY the cross-country trail looks like their logo, a bucking bronco, when viewed from the lifts above, and extends into the valley along the base of the Tetons. Skiers can rent equipment near the start of the trails, which often offer snacks and warm beverages as well, often in a more rugged shack like building. Groomed trails are about four to six feet wide with two small groves, usually on the side, for classical skiing. The groves help with balance and focus the energy of the forward glide. The grooming allows for fluid speed skating. In the racing world, classical races tend to be distance races, while skate skiing, with movements like rollerblading or ice-skating, is usually a sprint. A day, or even a few hours of cross-country skiing gets your heart rate up and your lungs filled with fresh cool air. Until you get your balance and the movements down, expect to fall. Wearing kneepads and extra padding on your bum can protect against bruising. Once you get the movements, cross-country skiing is a thrill of grace, agility and coordination that bonds the aerobic addict with the nature lover in you.